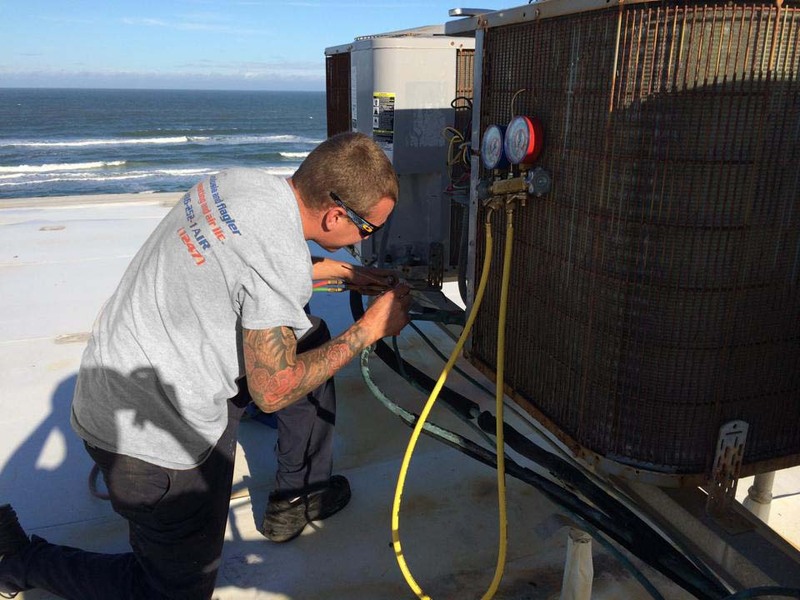 Florida’s intense weather can present challenges to your HVAC system and unfortunately strain and damage can occur at what seems like the worst time possible. Whether it is in the middle of a summer afternoon in August or at midnight in January during the worst cold front of the year, we are available to assist you when your system goes out. We pride ourselves in being able to provide thorough same-day service to our customers when they need us, and this includes after hours emergency services. Not everyone can wait days for an AC repair, nor should they. If your system is not working or you are concerned about something, call our office at (386) 252-1247. For After-Hours emergency service, click here. If you notice your unit failing to turn on, you may be able to solve the problem with a quick check of the thermostat. Often, it really is as simple as this. Be sure to start here and look into any of the other most basic fixes, like checking your circuit breaker. Maybe your unit is running but your house does not seem to be getting any cooler. In this case, you may want to check if your vents are blocked or obstructed in any way. Are your rooms not reaching the desired temperature? This can be caused by a wide variety of problems, including failure of the control module or sensor problems. If your AC controls are old and worn out, it is likely that they need to be replaced. If your HVAC unit is blowing warm air, most likely you need to change your filter (read our blog post about how often you should change your air filter). An easy enough task, which will require little more than a quick trip to the hardware store. However, if your filter is clean, it is more likely that there is an obstruction in your ductwork, or your HVAC coolant needs to be replenished. In either of these cases, you will need to contact a qualified HVAC technician to assist you. On the other end of the spectrum, you might find your AC unit frozen. As always, be sure to check your filter for any blockage. Obstructions in any part of your HVAC system may be the culprit, and so seeking these out immediately is the way to go. Homeowners can take it upon themselves to clear away most debris they may find. If you perform regular maintenance on your HVAC unit, you will be able to avoid many of the more significant problems that affect all homeowners, giving your unit a longer lifespan and saving you money in the long run. But most importantly, you need to identify when it is time to call for outside help, as some problems can cause personal hazards, or require costly repairs if handled on one’s own. When in doubt, give us a call, and save yourself some major problems. Click here to contact us through the website or call us at (386) 252-1247. Remember: we offer after-hours emergency services as well! © 2019 All Volusia and Flagler Heating and Air, LLC. All Rights Reserved.